Cardinal Jorge Mario Bergoglio of Argentina. His name: Pope Francis I. First Jesuit elected pope! Bad luck Obama! No American Pope tonight... well... Latin American... not USA! Bergoglio for Pope is a welcome surprise. It defeated all the experts bets. 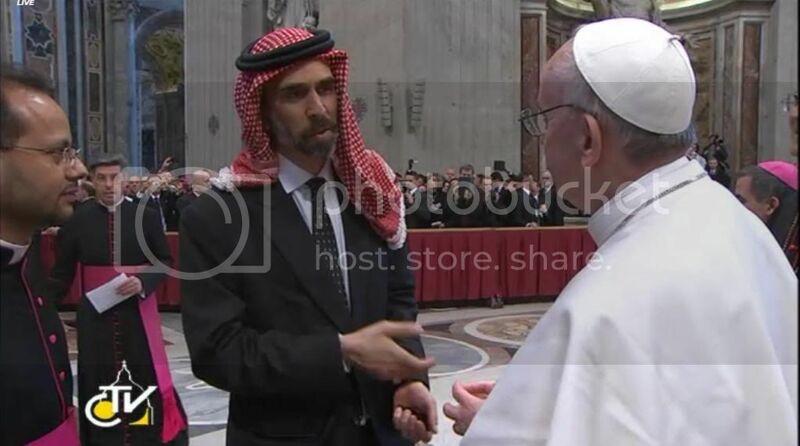 A people's person and a total opposite of ultra-sophisticated fashionista Benedict XVI. This man can't be Peter the Roman. Maybe that will be the next one. Also he looks like no illuminati guy. He will no longer be able to ride public buses neither will he be able to cook for himself. I hope he will be able to lead some serious reforms in the Vatican, cleaning up the pedophiles and banksters. He could very well end up like John Paul I - the PTB could do a job on him... who knows? I wish him the very best. He looks nice and a people's person. A welcome change from the one who occupied the seat before him. Strange that this guy didn't ban contraceptives, from what I have heard he approved using them to protect infections. Who truly knows where the guy is headed. We all know the history of Jesuits, a percent of them are definitely loyal, devoted, mindlessly following, some may even be so well dipped they would kill in the belief they are doing God's work. Nothing new here is there, the Holy Crusades, the Spanish Inquisition, heretics burned at the stake or simply tortured to death, look at our politics clergy, Billy the Graham for example, remember.. Religion is swell, no problem unless they want your mind, body and soul, corporate religions want your $$ and obedience. Big time religion has been and allways will be a corrider leading to controll. No offense to any religion or belief meant by my statement. Long ago I had a hallway house in South Boston, 36 guy capacity, vets, drunks, addicts, etc. A local rep of the Cardinal visited us and implored me and my partner to allow them to help, to have bingo, raffles etc. We didn't accept their aid, we told him this is Gods place nor ours ,he takes care of it, he believed us to be naive though he couldn't understand how we were the most successfull joint without taking money or getting in the game. We were NON profit, oddly enough each resident had food, a hot and cot, support. It was the best 7 years of my life, miracles on a daily basis seeing a broken human being getting on his feet, a true high.. The place name was the House of the Holy Spirit, most just called it the spirit house for short. They just couldn't get the picture if money wasn't in the frame. Wow Chris, thanks for sharing--you're a real inspiration to me. Not that I necessarily believe in the mumbo jumbo, but the literal translation of the phrase is Rock of Rome or Rome Rock as well as Peter the Roman. Bergoglio is an Italian name. His parents were also Italians, I think. white smoke, we have pope Francis who is a Jesuit. First time ever have they elected a Jesuit for a pope, I don't even know if that's allowed, since the Jesuits take an oath to be faithfull to the pope. How is that going to work? Also they have a sworn duty to the black pope, the Jesuit leader. So really now there is a white pope and black pope who are in charge, since the new pope takes orders from the black pope. This is all just getting confusing. He has labelled those fellow Church leaders who enjoy the trappings of high office as hypocrites, saying they forget that Jesus bathed lepers and ate with prostitutes. He lived in a small flat heated by a simple stove in a down town block, cooking for himself, travelling on buses and regularly visiting the sprawling slums on the outskirts of Argentina’s capital. He is also a Vatican Outsider . . .
After all, the last time they dared to elect a Pope who would ask questions he "died"
The reach of P2 (Progadanda Due), into the Vatican is documented and should be understood by all forum members. This man can't be Peter the Roman. If he's the first Jesuit pope elected, and if the Jesuits take orders from the black pope, and Francis is the white pope. That means that Francis is merely the puppet pope, hence the black pope is the one calling the shots behind the scenes, thus is Peter the Roman. He lived in a small flat heated by a simple stove in a down town block, cooking for himself, travelling on buses and regularly visiting the sprawling slums on the outskirts of Argentinaâ€™s capital. This Pope is a Pope for the people and the poor. He is progressive and a modernist. When he was Archbishop of Buenos Aires he did not want Mass in Latin anywhere in his governorship. Those priests who said Mass in Latin were outcasted and sent to break-away Catholic groups. He is against everything old fashioned and traditionalist. He hates to travel. He thinks it's a waste of money. We should not expect to see him travelling the world like Pope John Paul II. He also hates everything glitzy, all the gold vestments and show-off. During the conclave and after he was nominated Pope he wanted to travel by mini-bus and not an official Pope car. This morning he was taken in a black car but not on the official Pope vehicle the one with the registration SCV1 (Central Service Vatican). He loves Argentinian football and tango music. He had a current membership card in his local football club as Cardinal Jorge Bergoglio with his picture as a cleric. He is certainly an interesting man. He will get rid of some of the Curia and other hierarchy no doubt. He will pick his own people especially the Secretary of State. He will no longer be able to cook his own meals. Not sure if they will have the one person in charge of tasting the food before it is being served to him. That is also a part of the Papal protocol. They may have poisoned John Paul I's food. We don't know. Pope Francis has only one lung. His other lung was taken out when he was young and they had hardly any antibiotics back in the days. He seems to be in decent health for now. It could be a so-so short Papacy due to his age (76) but considering that Pope Emeritus Benny retired at 85 not being in any serious health condition this Pope could live until 90 or over. I bet he will not resign but nobody knows what the future holds. No Peter Turkson, no Tarcisio Bertone. Rome, Maryland, was the original name of a community within Prince George's County, Maryland, which would eventually become Washington, District of Columbia. Specifically, Rome was the original community name of Capitol Hill, upon which the United States Capitol Building sits. I asked a person I know who use to be a nun, and who also taught in a Catholic school about the St Malachy prophecy. She said it is not true. Francis (Latin: Franciscus Ecclesiastical Latin: [franˈtʃiskus]; born Jorge Mario Bergoglio; 17 December 1936) is the 266th and current pope of the Catholic Church, elected on 13 March 2013. In that role he is both the leader of the Church and Sovereign of the Vatican City State. A native of Buenos Aires, Argentina, he was ordained as a priest in 1969. In 1998 he became the Archbishop of Buenos Aires, and in 2001 a cardinal. 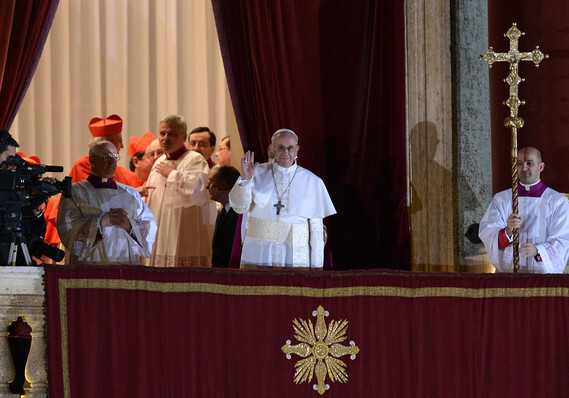 Following the resignation of his predecessor, Pope Benedict XVI, on 28 February 2013, the conclave elected Bergoglio, who chose the papal name Francis in honour of Saint Francis of Assisi. He is both the first Jesuit pope and the first pope from the Americas. He is also the first pope from outside Europe since Pope Gregory III in the 8th century. Jorge Mario Bergoglio was born in Buenos Aires, one of the five children of Italian immigrants of Piedmontese origin, Mario JosÃ© Bergoglio, a railway worker, and his wife Regina MarÃ­a Sivori, a housewife. In 1969, shortly after becoming a priest, Bergoglio had pulmonary problems which caused him to have a lung removed, but regained good health. He graduated from a technical secondary school as a chemical technician and then, at the age of 21, decided to become a priest. Bergoglio entered the Society of Jesus on 11 March 1958 and studied to become a priest at the Jesuit seminary in Villa Devoto. In 1960, Bergoglio obtained a licentiate in philosophy from the Colegio MÃ¡ximo San JosÃ© in San Miguel; in 1964 and 1965, he taught literature and psychology at the Colegio de la Inmaculada, a high school in the province of Santa Fe, Argentina, and in 1966 he taught the same courses at the Colegio del Salvador in Buenos Aires. In 1967, Bergoglio finished his theological studies and was ordained to the priesthood on 13 December 1969, by Archbishop RamÃ³n JosÃ© Castellano. He attended the Facultades de FilosofÃ­a y TeologÃ­a de San Miguel (Philosophical and Theological Faculty of San Miguel), a seminary in San Miguel, Buenos Aires province. Bergoglio attained the position of novice master there and became professor of theology. On contraceptives and gay marriage, he has, in the past, taken strict, conservative stances. And he once called abortion a â€œdeath sentenceâ€� for the unborn. Jorge Mario Bergoglio, the former Archbishop of Buenos Aires who was elected Pope by the papal conclave on Wednesday, was intimately involved in Operation Condorâ€™s â€œDirty Warâ€� in South America. A product of Chileâ€™s DINA secret police and five other national security states in Latin America â€” Argentina, Bolivia, Brazil, Paraguay and Uruguay â€“ Operation Condor was an intelligence operation designed to monitor, assassinate and disappear leftist dissidents who threatened the bankster economic operation underway in South America. 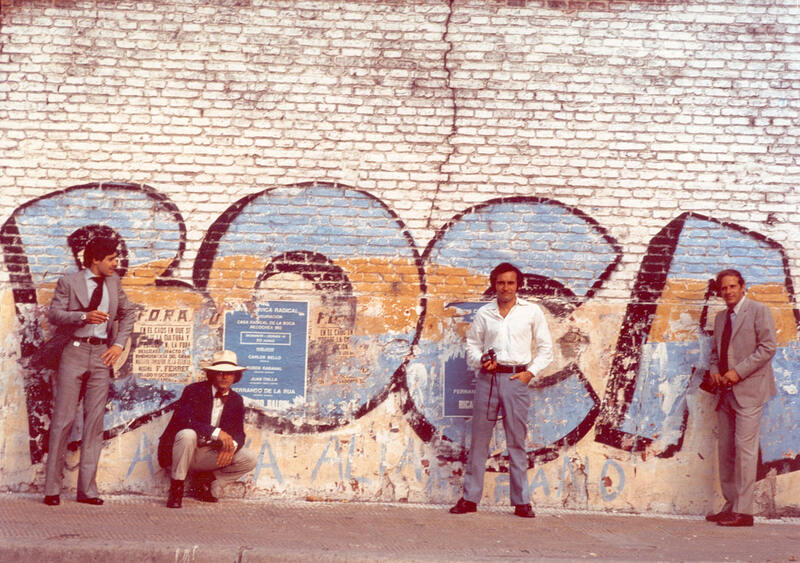 Like an idiot , I was in Argentina in the summer of 1975 as a guest of a student at a Gaucho cattle ranch when we arrived at Buenos Aires the streets had military on every street corner with machine guns... What did I know ? 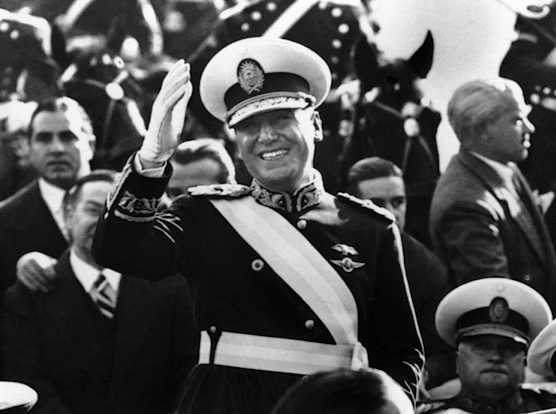 Between 1930 and 1973, Argentina suffered 30 military coups, with only a single president serving an entire term. In September 1975, the highest level of the military approved a coup that overthrew the established Peron government. During the next eight years, a military dictatorship characterized by government-based terrorism aimed primarily at students, young workers and intellectuals, was established. Censorship was rampant during this regime and all unions, political parties, and universities fell under military control. At this time, General Jorge Rafael Videla stated that in order to guarantee the security of the state, all the necessary people will die. Suspected activists, their friends, and relatives were often abducted from their homes in the middle of the night and moved to government detention centers in which they were tortured and eventually killed. These individuals who disappeared without a trace are referred to as the Disappeared. It is estimated that as many as 30,000 individuals disappeared over this time period. In March,1976, nine people disappeared for every two found murdered. People who protested these atrocities soon became one of the Disappeared or were murdered themselves. Abducted women who were pregnant were kept captive in detention centers and military hospitals until the birth of their children, and then murdered shortly after delivery. Babies and young children of abducted individuals were also abducted, based on the assumption that subversives breed subversives. Abducted children were handed over to neighbors, given to orphanages or retained as war booty for childless couples who were part of the security forces. An estimated 220 children were abducted with their parents or born in captivity to abducted women. 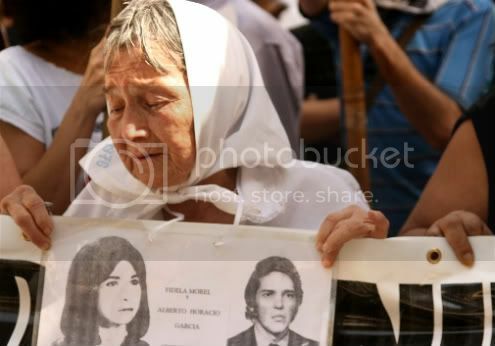 On April 30, 1977, four mothers gathered at Plaza de Mayo to bring attention to their plight as they attempted to find their missing children. They were soon joined by the "Grandmothers," women who had given up hope of finding their own children, but believed that their grandchildren might have survived. In October, 1977, this group of women founded the Association of Abuelas (Grandmothers) of the Plaza de Mayo. In 1980, the Grandmothers found an article about identification by blood and asked several American scientists to help them create a grandparentage test. >Red World: Argentina: Neo-Peronist regime closely allied to Bolivarian Axis, military junta crushed communist insurgency in "Dirty War"
The Pope has been accused of failing to stand up to the brutal military junta that slaughtered tens of thousands of Argentines in its so-called Dirty War. Critics say Jorge Mario Bergoglio did little to help those who disappeared when the country was under right-wing military rule â€“ and too much to criticise the left-wing opponents of the generals. He has even been accused of turning a blind eye to the rounding up and torturing of his own Jesuit priests, something he strongly denies. The period became a by-word for brutality, with thousands of families suffering the disappearance of loved ones and the adoption by the armed forces of murder methods such as throwing detainees out of aeroplanes. One form of torture for families was the kidnapping of babies of mothers murdered as enemies of the regime and their adoption by families approved by the military dictatorship. The bishops of Argentina, led by Bergoglio, published an apology in October last year in which they acknowledged that the church had not protected its faithful. However the statement still blamed leftists as well as the junta for the killings. The bishops appealed for information about where bodies had been buried or knew identities of stolen babies to come forward. However the apology came too late for liberal and left critics. 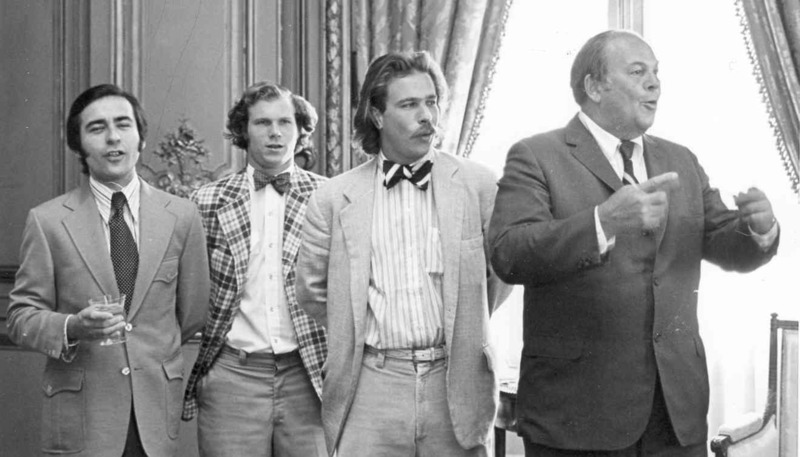 They point to Bergoglioâ€™s refusal to give evidence in open court on the events of the 1970s until 2010, when his answers were considered evasive by some. He is also accused of failing to prevent the torture of two of his own Jesuit priests, Orlando Yorio and Francisco Jalics, both supporters of left-wing liberations theology who were seized by the regime in 1976. 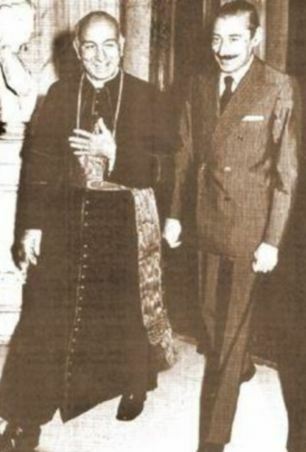 However supporters of Bergoglio say he took risks behind the scenes, including visiting the home of dictator Jorge Videla to say mass and appeal for mercy. Secret Argentine documents record Operation Condor kidnappings and disappearances carried out by military intelligence Battalion 601. Washington, D.C., March 23, 2006 - On the eve of the 30th anniversary of the military coup in Argentina, the National Security Archive posted a series of declassified U.S. documents and, for the first time, secret documents from Southern Cone intelligence agencies recording detailed evidence of massive atrocities committed by the military junta in Argentina. The documents include a formerly secret transcript of Henry Kissinger's staff meeting during which he ordered immediate U.S. support for the new military regime, and Defense and State Department reports on the ensuing repression. The Archive has also obtained internal memoranda and cables from the infamous Argentina intelligence unit, Battalion 601, as well as the Chilean secret police agency, known as DINA, which was secretly collaborating with the military in Buenos Aires. ADDITIONAL DETAILS: This is an original press photo. 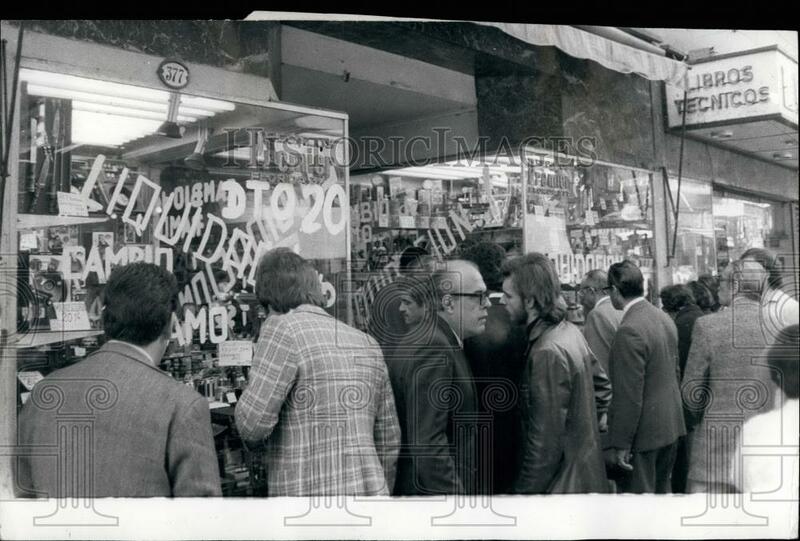 Inflation In Argentine: With the ever increasing high rate of inflation which is bringing in its wake more unemployment, shops in the fashionable Calle Florida, Buenos Aires, are forced to offer theit goods at greatly reduced prices, but they are still too high for these Argentine onlookers. Photo measures 10 x 6.75inches. Photo is dated 09-09-1975. Argentina was hell on earth for many years. Henry K. luved it. Sadistical Pyschopaths given a free reign, I may be off base but I heard somewhere the US Intell sent squads of experts in the art of torture to train ( teachers-advisors) , torture techy's. 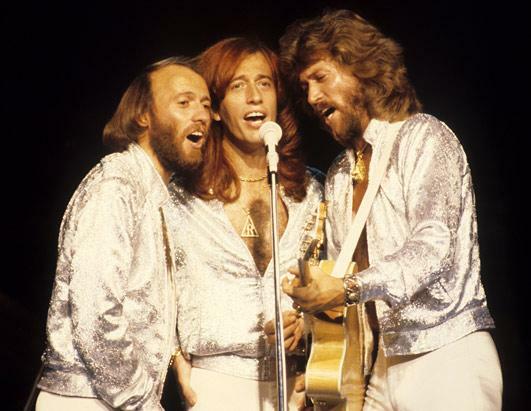 Personelly, when these guys put on their silken robes, gold jewelry, sit on their gem imbeded throne and stick out their ring to get kissed I'm not impressed, in fact it disqusts me. Corporate religions telling the folks how to live, wow, the more things look like their changing-they're not, it's back to the dark ages. In days of old there was a man who approached the holy bosses and said something along the lines, they were filled with shiiite. Yup, they had him wacked out. As Chile and Argentina finally seek justice for those who were tortured, raped, and "disappeared" under the right-wing dictatorships of the 70s, the declassification process in Washington is revealing the horrifying complicity of then U.S. secretary of state Henry Kissinger. Will be posted on GCN shortly! Show in process! the fact that he celebrated Hanukkah in a Jewish Temple, and participated in non-Christian worship, by itself constitutes a total knockout punch. Itâ€™s a fact from which he and his supporters cannot recover no matter how hard they try. It proves to anyone with any bit of good will that heâ€™s not the pope, and exposes his malicious apostasy in gory detail. It suks being a cynic, but I have to confess I am. I wish I could scream , holler and cheer for any guy the MSM proposed to be a true human being on a mission of honesty and honor. I can't profile this guy, and frankly given the evidence I have sniffed around in find it impossible. My take , it's a wait and see. 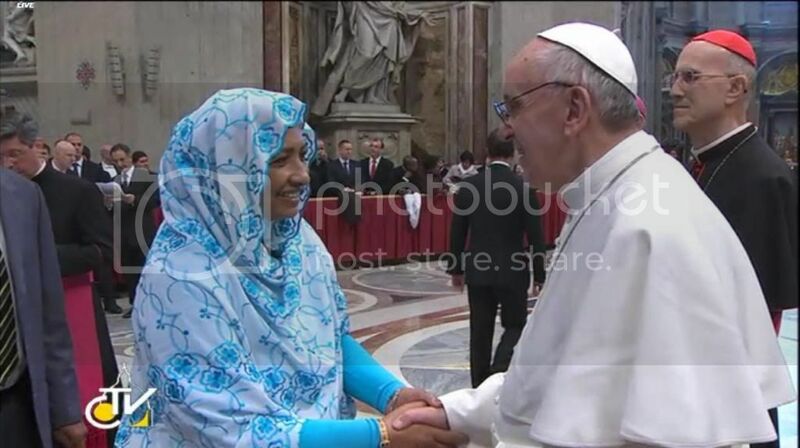 He has been received enormous attention as being a champion of the poor, humble, in short the perfect image of a pope. Problem is I just don't swallow the headlines and propaganda, Yup I have a problem with corporate religions, not the parishioners. In fact I have a problem, throughout my life I have seen mucks getting into positions of power deceiving and end up joining the elite club. Unfortunately I have to wait and see. The publicity reminds me of Obamas campaign promises, promises,,MSM, no offense to those of this religion. Well this link shares some interesting info about this new pope and quotes several Statesman back in the 1800's. It also tells about their secret societies, etc. Nope, nothing significantly occultic there. Someone also mentioned something occultic in the time the white smoke started and the time he appeared at the window? It was 7:06pm when the white smoke appeared and 75 mins later he appeared, 8:21pm local time. What is the significance, if any? Also, is there any connection to a (first time) Jesuit from S. America (first time) becoming pope right after Venezuela's leader, Chavez, dies? 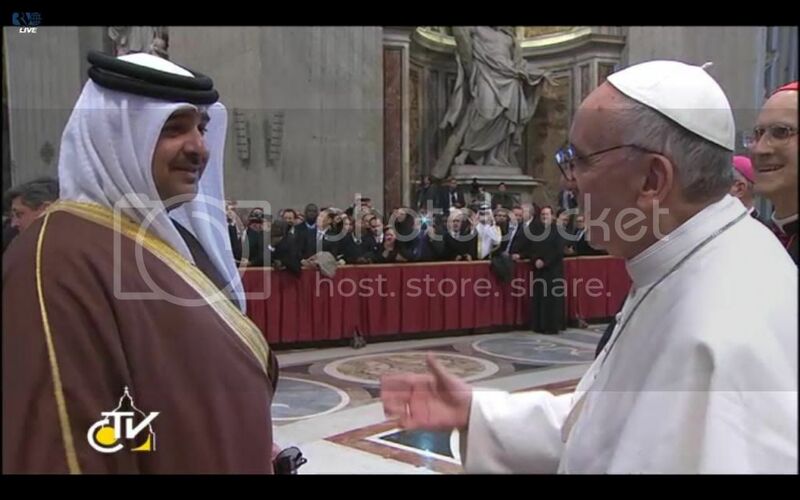 Tom Horn wrote Petrus Romanus: The Final Pope is Here. An email he wrote to Steve Quayle is below. The 35th General Congregation of the Society of Jesus convened on 5 January 2008 and elected Fr. Adolfo NicolÃ¡s as the new Superior General on 19 January 2008. A month after, the Pope (Benedict) received members of the General Congregation and urged them to "to continue on the path of this mission in full fidelity to your original charism" and asked them to reflect so as "to rediscover the fullest meaning of your characteristic 'fourth vow' of obedience to the Successor of Peter." For this, he told them to "adhere totally to the Word of God and to the Magisterium's task of preserving the integral truth and unity of Catholic doctrine." This clear identity, according to the Pope, is important so that "many others may share in your ideals and join you effectively and enthusiastically." The Congregation responded with a formal declaration titled "With New Fervor and Dynamism, the Society of Jesus Responds to the Call of Benedict XVI", whereby they confirmed the Society's fidelity to the Pope. As a Jesuit, Bergoglio makes the perfect Pope to fulfill our second book's Chardinian Jesuit predictions who argue in favor of a coming an alien savior. I would worry more about what's happening in Cyprus -- bank runs that could spread to the whole Euro zone over the weekend than the new Pope being or not being Peter the Roman. My thought is that he is not Peter the Roman. My idea is he is a decent man who wants to clean up the House (the Vatican) and sell a lot of property to profit the poor. The problem is that he very well might end like Pope John Paul I - with a very short pontificate. Francis Jorge Bergoglio of Buenos Aires is a Hugo Chavez of Papacy -- it won't go well with the PTB. I would not be surprised if Emeritus Pope Benedict lives a longer life than his successor Francesco Jorge Bergoglio. The Cyprus bank run fever could spread to Spain, Portugal, Italy and France in a flash. People in Cyprus have reacted with shock to news of a one-off levy of up to 10% on savings as part of a 10bn-euro (Â£8.7bn; $13bn) bailout agreed in Brussels. Savers could be seen queuing at cash machines amid resentment at the charge. The deal reached with euro partners and the IMF marks a radical departure from previous international aid packages. President Nicos Anastasiades defended it as a "painful" step, taken to avoid a disorderly bankruptcy. The Cypriot leader, who was elected last month on a promise to tackle the country's debt crisis, will address the nation on Sunday. The deposit levy - set at 9.9 per cent on bank deposits exceeding 100,000 euros and at 6.7 per cent on anything below that - will take force on Tuesday after a bank holiday on Monday. "They call Sicily the island of the mafia. It's not Sicily, it's Cyprus. This is theft, pure and simple," said a pensioner. "The Levy is a one-off measure." Detailed picture - all Popes rings have Saint Peter on them. They are the best team in the country. He was made a life member after he became Pope. Tomorrow morning will be the new Pope's inaugural Mass in Saint Peter's square. Some like US Vice-President Joe Biden, Nancy Pelosi and Argentine President Cristina Kirchner -- none of them are known for friends of the poor -- will be showing off their faces at the Pope's inaugural ceremony. Is this the U.S. V.P. Joseph Biden? Why did he look so uptight? This was a happy ceremony not a funeral. I caught a few screen shots during the Pope's inaugural ceremony this morning. We never get to see Frau Merkel with husband. This time he was there. Now we know what he looks liike. I want ya to know that i respect ya, like your posts and then some, you have been around the block and shoot strait. matter, $$$$, ya know. Maby this guy is 100% on the level, I don't know, have doubts but can't hit the dime. Its been said some Popes have gone to teach the Vatican the deal, and then discoivered the Vatican was teaching the. So who knows? Ya, I like the hype, he sounds MSM cool, lets hang on and wait, or at least thats what I'm doing. T assume that religions have never been involved with politics just doesn't get there for me. No offense. They ain't make'n Popes like they used to. Note: I'm starting to sense that the new Pope is, if nothing else, at least less bad than the last one was. Time will tell. According to insider reports, the manager of this effort to elect an American pope was New York Cardinal Timothy Dolan, who focused on the effort to install Boston Cardinal Sean Oâ€™Malley as the new pontiff. Italian newspaper accounts revealed that Oâ€™Malleyâ€™s main advisor was the clergyman Terrence Donilon, the brother of Tom Donilon, the political operative who currently serves as the director of the National Security Council in the Obama White House. The danger was thus clear enough that, if Oâ€™Malley had prevailed, the next pope would get his inspiration from 1600 Pennsylvania Avenue. To pose this danger in slightly different terms: Governor Martin Oâ€™Malley of Maryland is currently a quite serious candidate for the Democratic presidential nomination in 2016. If Sean Oâ€™Malley were to become pope, the potential might then exist to have within a few years President Oâ€™Malley in Washington and Pope Oâ€™Malley in Rome. As the great Italian poet Dante argued 700 years ago in his Divine Comedy, it is essential for the spiritual and religious power of the papacy to be kept separate from the political and military power of the empire. The virtual absorption of the Vatican by Washington could well have spelled the final collapse of the Catholic Church. On the day after his election, Francis went personally to the guesthouse where he had been staying in Via della Scrofa in downtown Rome to pay his bill and pick up his baggage. As part of this gesture of humility, he had no elaborate security and no disruptive motorcade, but rode in a single automobile of the papal gendarmes. Under Benedict XVI, the Vatican had appeared under siege, doubtless as a result of the popeâ€™s gullible acceptance of the Anglo-American phantom of a global war on terror. The Vatican remains haunted by the mysterious death of John Paul I in 1978, and by the 1981 attack carried out by Ali Agca, a co-worker of Frank Terpil of the CIA. But Francis is signaling that he is not afraid, and is not willing to hunker down behind the Vatican walls. Another danger which has been avoided is the election of an oligarch camouflaged as a modernizer or reformer. This was the role sought by the late Cardinal Carlo Maria Martini of Milan, who did not live to see this yearâ€™s conclave. This yearâ€™s plausible oligarch-reformer might have been Cardinal Schonborn of Vienna, a representative of the feudal aristocracy of the Holy Roman Empire. And there were others seeking to play this role. 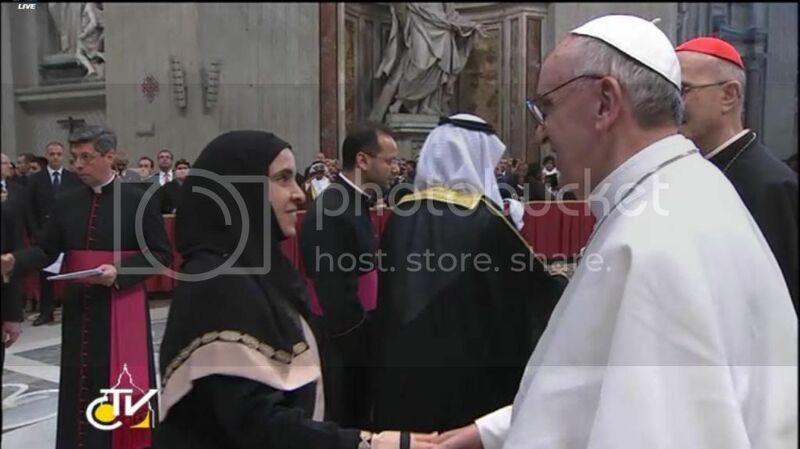 Instead, Bergoglio brings with him the concerns of the global South, starting with the imperative of economic development and the eradication of poverty. Bergoglioâ€™s track record in this regard is instructive. The Argentine military junta of 1976-1983 and the neoliberal economic policies it started wrecked the nationâ€™s economy during the 1990s. By the end of the military government, unemployment was at 18% officially, and there were bouts of hyperinflation at the end of the 1980s. Under the pro-IMF economics Minister Domingo Cavallo, Argentina established a fixed rate of exchange to the US dollar. The propertied classes indulged in massive tax evasion and sent flight capital to foreign banks. Taking power in the midst of this crisis, President de la Rua imposed seven rounds of brutal austerity, driving unemployment up to 20% in December 2001. When the IMF cut off further loans to Argentina, there was a panic run on the banks. Strikes and riots forced de la Rua to resign and flee on December 21, 2001. The emblem of the Jesuits features an Atonist solar rays. IHS was originally the insignia for Bacchus, himself a derivation of Aryan Iesa or Esus., The Pope has, from the inception of the Roman Church, been referred to as Servus Servorurm Dei - "Servant of the Servants of God"
The Church of the GesÃ¹ (Italian: Chiesa del GesÃ¹; Italian pronunciation: [ˈkjɛːza del dʒeˈzu]) is the mother church of the Society of Jesus, a Roman Catholic religious order also known as the Jesuits. Officially named Chiesa del Santissimo Nome di GesÃ¹ all'Argentina (English: Church of the Most Holy Name of Jesus at the "Argentina"), its facade is "the first truly baroque faÃ§ade", introducing the baroque style into architecture. The church served as model for innumerable Jesuit churches all over the world, especially in the Americas. The Church of the GesÃ¹ is located in the Piazza del GesÃ¹ in Rome. In 1540, Saint Ignatius of Loyola needed a church to serve as the center of his newly founded Society of Jesus (the Jesuits), which the Farnese-family Pope Paul III formally recognized that year. One of the Society's members was the priest of a church called Our Lady of the Way, which the Pope designated as the Society's official church. Saint Ignatius, finding the church too small, began fund-raising to construct a church worthy of the "Name of Jesus." It took him 10 years to get the necessary permits before he could break ground. But the original site wasn't ideal, so new plans were drawn up with Michelangelo being involved in the design. A second ground-breaking ceremony took place, but this time wealthy neighbors fought the construction which would affect their houses. The Pope's grandson, who was now Cardinal Farnese, agreed to fund the church and the final ground breaking took place in 1568, 18 years after the first. Unfortunately, St. Ignatius never lived to see the construction, but the church became his final resting place, making Il GesÃ¹ an important shrine for pilgrims to this day. The greatest of these clerical orders by far was the Society of Jesus, founded in 1540 by the Spaniard Ignatius Loyola (1491-1556). Loyola, who had been a soldier, turned to religion after receiving a painful wound in battle. From the first the Jesuits were the soldiery of the Catholic church; their leader bore the title of general, and a military discipline was laid down in Loyolaâ€™s Spiritual Exercises, which set the rules for the order. The Jesuits have always been a center of controversy. To their hostile critics, the Jesuits have seemed unscrupulous soldiers of the pope, indulging in dirty fighting if such tactics seemed likely to bring victory. They have been accused of preaching and practicing the doctrine that the end justifies the means and also of pursuing worldly power and success. Yet historical record leaves no doubt of Jesuit success in bolstering the spiritual as well as the material credit of Catholicism. Jesuits seemed to be everywhere, in Hungary, in Poland, in England, in Holland, trying to win back lands and peoples from the Protestants. They were winning new lands and peoples on the expanding frontiers of the West, in India, in China, in Japan, in North America. They were martyrs, preachers, teachers, social workers, counselors of statesmen. While the Society of Jesus was the chief new instrument of the Catholic Reformation, an old instrument of the church was also employedâ€”the Inquisition. This special ecclesiastical court in its papal form had been started in the thirteenth century to put down the Albigensian heresy, and in its Spanish form in the fifteenth century to bolster the efforts of the new Spanish monarchy to force religious uniformity on its subjects. Both papal and Spanish inquisitions were medieval courts that used medieval methods of torture, and both were employed against the Protestants in the sixteenth century. The Jesuits were founded initially as The Company of Jesus on "Assumption Day" August 15, 1534, also being the traditional feast day for Lucifer since 70CE, in a secret ceremony in the crypt of the Chapel of St. Denis by Ignatius of Loyola (born Ã�Ã±igo LÃ³pez de Loyola) and Francisco Xavier, Alfonso Salmeron, Diego LaÃ­nez, and NicolÃ¡s Bobadilla all from Spain, Peter Faber from Savoy in France, and SimÃ£o Rodrigues from Portugal. The formation was approved by Francis Borja, of the infamous "Borja" also known as Borgia/Borga, Duke of Grandia, grandson of Pope Alexander VI and the patron of Ignatius of Loyola. Francis Borja was the principle financier and architect in the formalization of the Jesuits into the first dedicated military order of monks of the Catholic Church. He was also responsible for securing the Papal Bull Regimini militantis (September 27, 1540) from Borja family friend Alessandro Farnese Pope Paul III which first gave the Jesuits official status as an order. Ignatius of Loyola first came to the attention of the young Duke of Grandia by 1529 after Ignatius was again arrested by the Inquisition for practicing extreme religious devotion. Borja saw potential in the extreme military based devotion being preached by Ignatius of Loyola and his desire to establish an order of military monks. It was the young Borja who saved the life of Ignatius from the Inquisition. At the death of Ignatius in 1557, Francis Borja was expected to be the second Superior General. However, his ambitions were hampered firstly by arch-enemy Giovanni Pietro Carafa as Pope Paul IV (1555-1559). Carafa had been one of the greatest enemies of Borja Pope Alexander VI and immediately nominated Diego Laynez (James Lainez) as Superior General. Pope Paul IV died in August of 1559 and was replaced by Giovanni Angelo de' Medici (Pope Pius IV). In both cases, Jesuit Superior General Diego Laynez aligned himself closely making him virtually untouchable. However, after Pope Pius IV rounded up and tortured and murdered Benedetto Accolti and other members of Papal families in an alleged failed plot, Cardinal Borja made his move and Pius IV was poisoned to death on December 9, 1565. A few days later, Superior General Diego Laynez suffered the same fate and soon after Cardinal Francis Borja was unanimously elected the third Superior General. By 2008, the Jesuit Order, especially in the United States was a shell of its former brilliance. Over populated by blissfully nihilistic, barely competent, arrogant and undisciplined recruits, the once dominant United States faction had slid to a terminal point of complete irrelevance. 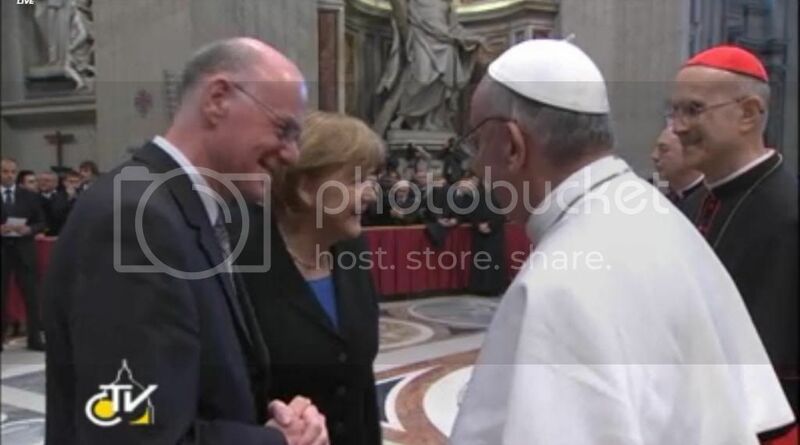 It was at this time that Peter Hans Kolvenbach chose to resign from the office of Superior General to become a "visitor" - a role focused on the revival of the spiritual dimension of the Order. The election of Pope Francis on March 14th 2013, the traditional "Day of Blood" and ancient birthday of Mithra represents a further historic turning point for the Jesuits and the Catholic Church in a rejection of the insanity of nihilism and the potential implementation of promised reforms of Vatican II and focus on personal responsibility. was a Grandee of Spain, a Spanish Jesuit, and third Superior General of the Society of Jesus. He was canonized on 20 June 1670 by Pope Clement X. The Borja whilst wealthy and of position, had continued to lose face and influence within the Papal corridors of power, particularly since the infamous publishing of Dante Alighieri epic poem The Divine Comedy (1316) and the slandering of the Borja both as part of the eighth circle of Hell and notable members in it in serving Lucifer. Arrested at night, tortured underground and upon confession, the accused was handed over to â€œthe secular armâ€� to be burned. Over the centuries sixty-eight million perished amidst this horror according to one of our heroes, the late ex-Jesuit, Alberto Rivera. To deceive the Nations it [The Inquisition] was formally abolished in 1834, but it continued in secrecy, and later openly, under other names. In the Twentieth Century the Jesuits have conducted their Inquisition under the names of Nazism, Fascism, Communism and now Islamic Terrorism with their Inquisitors, Adolf Hitler, Francisco Franco, Joseph Stalin and now Osama bin Laden. Today the Black Pope orders his Holy Office of the Inquisition, renamed in 1965 â€œThe Sacred Congregation for the Doctrine of the Faith,â€� through his International Intelligence Community headed by the Sovereign Military Order of Malta. Ridpathâ€™s Universal History, John Clark Ridpath, (New York: Merrill & Baker, 1901) Vol. XIII, p. 297. 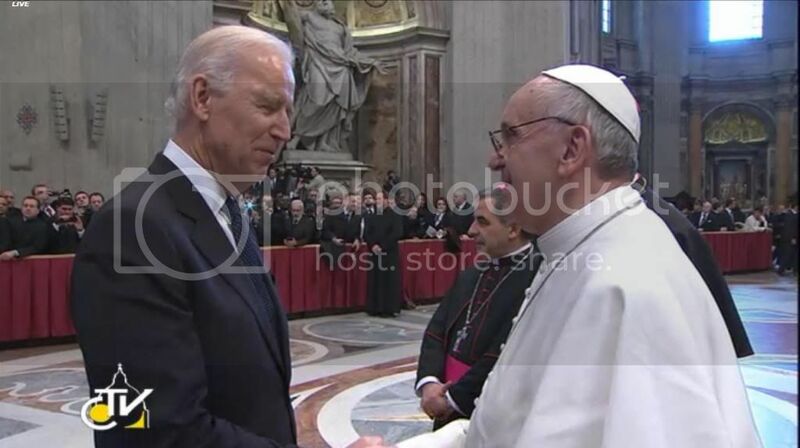 Pope meets with Pope (retired). First time in History. 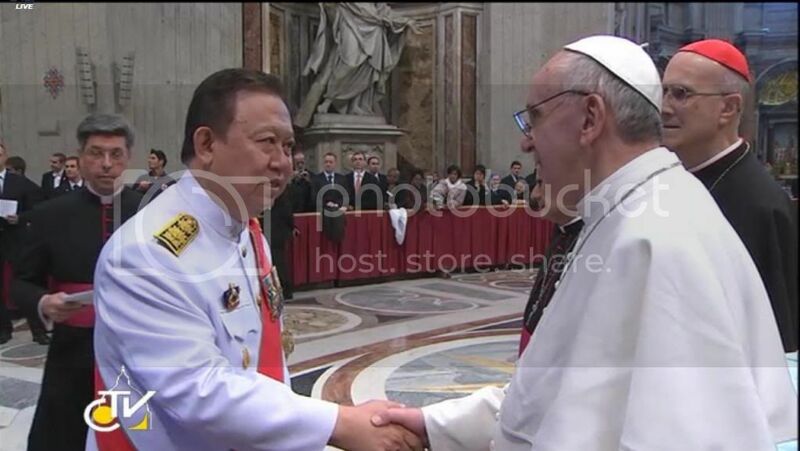 There was no existing protocol for the two Popes meet-up. All was improvised. 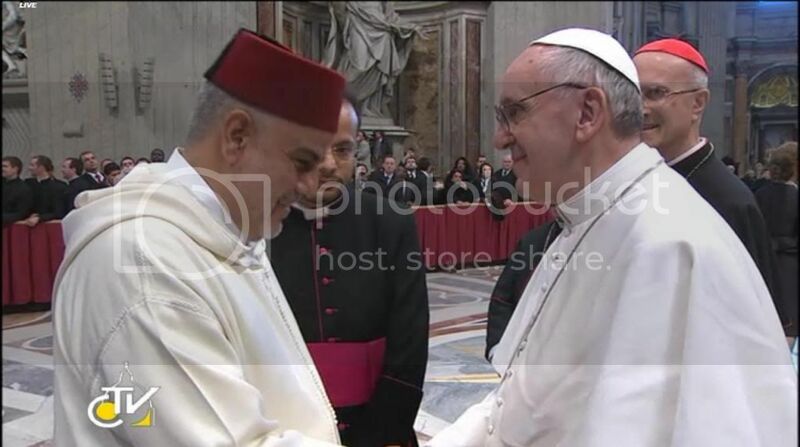 The new Pope meets his predecessor Pope Benny for prayer, lunch and private talks. Pope Benny welcomed Pope Francis after he landed in the helicopter. He welcomed him like an old friend or a brother. The article said there was no array of guests invited for lunch. There was only the two Popes and their assisting Bishops. Old Pope Benny seems to have trouble walking, even with a cane. The new Pope Francis looks in very good health despite living with only one lung.